Edible mushrooms have been treasured as not only as culinary delicacies, but also medicine since ancient times. Warriors in ancient Greece took mushrooms to gain strength for battle; to the Romans, the mushrooms were the “Food of the Gods”. Similarly, in ancient China, mushrooms were considered the “elixir of life” . Once considered to be rare and precious, many types of edible mushrooms are widely grown commercially today, making them readily available for everyone to enjoy. A variety of commercially cultivated mushrooms are now available on the market. 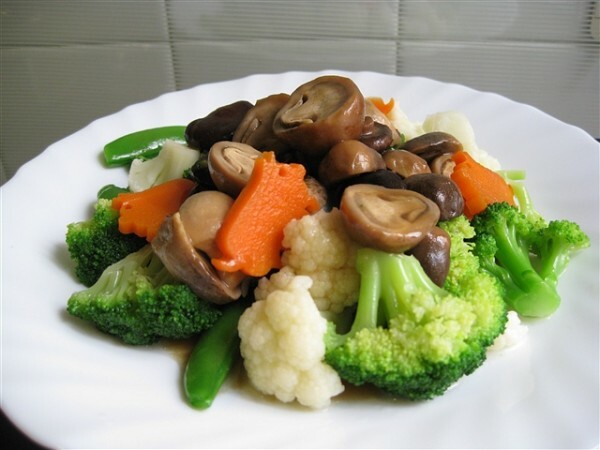 Double mushrooms with vegetables, a signature Chinese dish. Mushrooms are tasty and full of flavours. Mushrooms contain a wide variety of umami (or savoury) taste compounds . The interactions of these umami compounds on taste buds create longer-lasting taste sensations, making food taste delicious. For example, in Chinese cuisine, fresh mushrooms that contain naturally occurring glutamate, often are combined with dried, rehydrated mushrooms that contain naturally occurring guanylate, to create the signature double mushroom dish (扒双菇). The combination of glutamate and guanylate complement and enhance the flavours of the dish. Mushrooms are so tasty that it is widely used as a natural flavour enhancer in many culinary practices, with extracts of mushrooms made into sauces and gravy to complement and enrich every dish. Most notably in Chinese vegetarian cooking, extracts of dry shiitake mushrooms are used as a replacement for savoury oyster sauce for everyday cooking. Mushroom extracts in cubes or powder forms are also used in place of mono sodium glutamate (MSG) as healthier substitutes. Common edible mushrooms include button, shiitake, enoki, oyster, and portabella. All these mushrooms are high in protein and several under consumed nutrients such as dietary fibres, potassium, vitamin D, and calcium . Mushrooms are also a good source of niacin, riboflavin, pantothenic acid, selenium, and copper. Consistent consumption of mushrooms over time contributes to a nutritious diet . Most interestingly, mushrooms are unique compared to other plants as they can generate vitamin D when exposed to sunlight, converting vitamin D precursor ergosterol to vitamin D2 (ergocalciferol). To increase the vitamin D in mushrooms for more than 100% of its original content, simply by exposing them to sunlight for as little as 15 minutes on a clear or partly cloudy day between 9:30 AM and 3:30 PM . With vitamin D deficiency linked to the risk of many diseases, including osteoporosis, arthritis, diabetes, cancer, cardiovascular disease, etc. Consuming mushrooms regularly can help to alleviate the risk of vitamin D deficiency. Exposure to sun light increases vitamin D content of mushrooms. Grilled portabella mushroom burger – A meatless choice that is low in calories, fat, and sodium. Constant exposure to oxidative stress due to imbalanced metabolism and excessive reactive oxygen species can damage health and accelerate aging . The body requires a host of antioxidants from food to defend against oxidative stress. Edible mushrooms, both wild and cultivated, contain bioactive compounds, such as polyphenols, polysaccharides, vitamins, carotenoids and minerals that have significant antioxidant properties . For this reason, in traditional Chinese medicine, edible mushrooms, especially Ling Zhi (Ganoderma lucidum) and Cordyceps (Cordyceps sinensis), has been used in anti-aging formula to refresh the body and promotes longevity . However, such properties are not only restricted to expensive and exotic mushrooms. In a laboratory experiment, fruit flies fed with antioxidants from oyster mushrooms (Pleurotus spp.) lived longer than those did not . 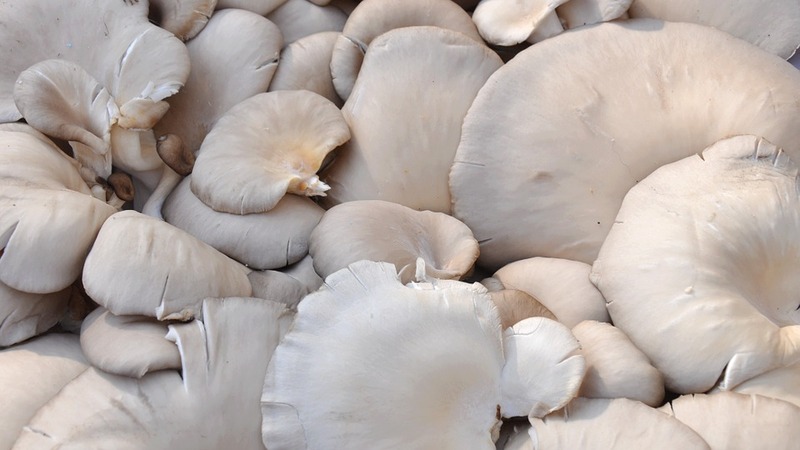 Oyster mushrooms are packed with loads of antioxidants. Mushrooms are also known to have strong anti-inflammatory properties. Various types of mushrooms have been used in folk medicine to reduce pain and inflammation. Modern medicine also started to consider mushrooms as a potent natural source of anti-Inflammatory agents to reduce the reliance on nonsteroidal anti-inflammatory drugs . For example, the blood inflammatory markers of patients with inflammatory bowel diseases, ulcerative colitis, and Crohn’s disease were shown to significantly decrease after taking a mushroom extract mixture of almond mushroom, bearded tooth mushroom, and Maitake for 12 days . 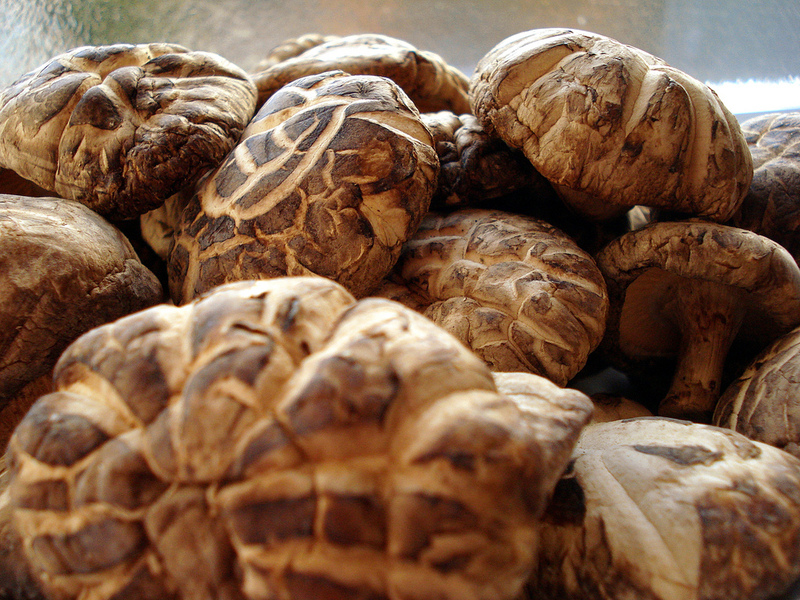 The anti-cancer and immunomodulating properties of many medicinal mushrooms have attracted immense interest in research and clinical application of cancer treatment. Mushrooms are known to complement chemotherapy and radiation therapy by countering the side-effects of cancer, such as nausea, bone marrow suppression, anaemia, and lowered immune resistance . The polysaccharide, β-glucan, from mushrooms is the best known and most potent mushroom-derived substances with anti-tumour and immunomodulating properties. Current research findings also suggest that some mushrooms can work in synergy in combination with anti-cancer drugs for effective treatment of drug-resistant cancers . Many of the commercially available edible mushrooms, such as button, almond, oyster, shiitake, and Maitake also have similar contents of effective anticancer compounds, hence regular consumption of mushrooms may also have cancer prevention effects . One study in Korea, which examined 358 breast cancer patients and 360 cancer-free controls, found that high consumption of mushrooms might be related to lower risks of breast cancers, especially among premenopausal women . Another study conducted in Guangzhou, China, also found that intake of mushrooms, particularly the white button mushroom, is associated with the lower incidence of ovarian cancer. These studies demonstrated the cancer preventive benefits of consuming mushrooms regularly. Beside health and taste, eating more mushrooms is also good for the environment. 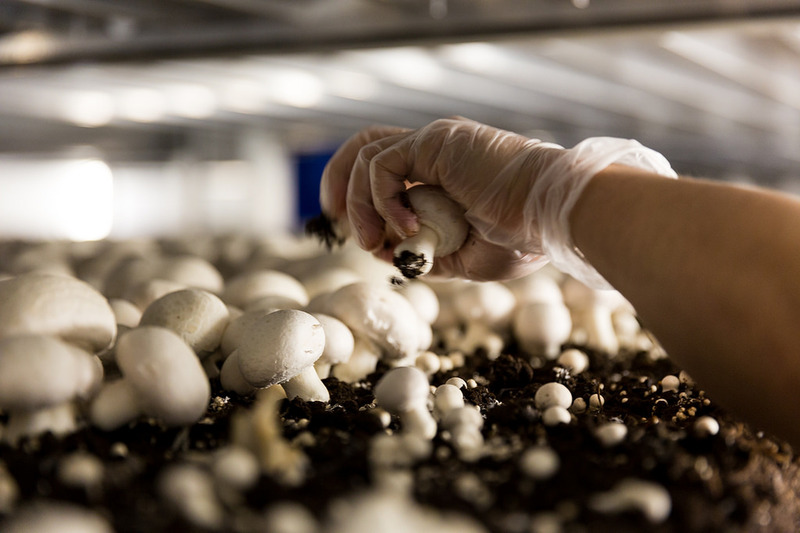 Commercial mushrooms production is consistent with a sustainable food supply. Mushroom production requires a small land size that can be easily managed by a local family owned business. Mushroom farms recycle by-products from other agricultural or horticultural sectors that previously posed waste management challenges. The substrate material that mushrooms grown on can also be recycled as a soil amendment. Mushrooms are grown indoors with little energy and water needs . The sustainability of mushroom production has created an important food source for current and future generations to enjoy. Mushrooms are healthy on the plate and gentle on the Earth! M.E. Valverde, T. Hernández-Pérez, O. Paredes-López, Edible mushrooms: Improving human health and promoting quality life, Int. J. Microbiol. 2015 (2015). doi:10.1155/2015/376387. A. Shin, J. Kim, S.-Y. Lim, G. Kim, M.-K. 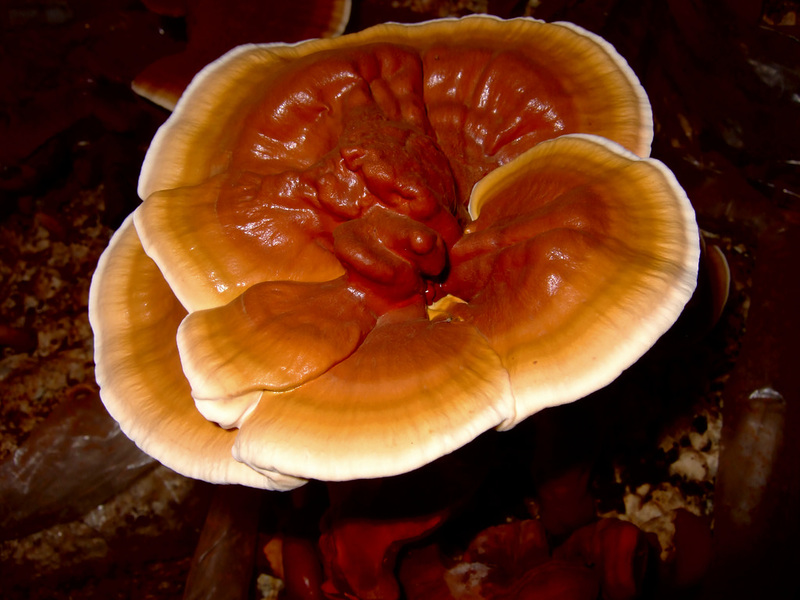 Sung, E.-S. Lee, J. Ro, Dietary Mushroom Intake and the Risk of Breast Cancer Based on Hormone Receptor Status, Nutr. Cancer. 62 (2010) 476–483. doi:10.1080/01635580903441212. M. Jo Feeney, A.M. Miller, P. Roupas, Mushrooms—Biologically Distinct and Nutritionally Unique, Nutr. Today. 49 (2014) 301–307. doi:10.1097/NT.0000000000000063. K.M. Phillips, A.S. Rasor, A Nutritionally Meaningful Increase in Vitamin D in Retail Mushrooms is Attainable by Exposure to Sunlight Prior to Consumption, J. Nutr. Food Sci. 3 (2013). doi:10.4172/2155-9600.1000236. R. Zhang, D.P. Naughton, Vitamin D in health and disease: current perspectives., Nutr. J. 9 (2010) 65. doi:10.1186/1475-2891-9-65. D. Mozaffarian, Dietary and Policy Priorities for Cardiovascular Disease, Diabetes, and Obesity, Circulation. 133 (2016). http://circ.ahajournals.org/content/133/2/187 (accessed July 11, 2017). K.H. Poddar, M. Ames, C. Hsin-Jen, M.J. Feeney, Y. Wang, L.J. Cheskin, Positive effect of mushrooms substituted for meat on body weight, body composition, and health parameters. A 1-year randomized clinical trial, Appetite. 71 (2013) 379–387. doi:10.1016/j.appet.2013.09.008. A. Myrdal Miller, K. Mills, T. Wong, G. Drescher, S.M. Lee, C. Sirimuangmoon, S. Schaefer, S. Langstaff, B. Minor, J.-X. Guinard, Flavor-Enhancing Properties of Mushrooms in Meat-Based Dishes in Which Sodium Has Been Reduced and Meat Has Been Partially Substituted with Mushrooms, J. Food Sci. 79 (2014) S1795–S1804. doi:10.1111/1750-3841.12549. A.D. Romano, G. Serviddio, A. de Matthaeis, F. Bellanti, G. Vendemiale, Oxidative stress and aging., J. Nephrol. 23 (2010) S29-36. http://www.ncbi.nlm.nih.gov/pubmed/20872368 (accessed July 12, 2017). M. Kozarski, A. Klaus, D. Jakovljevic, N. Todorovic, J. Vunduk, P. Petrovi, M. Niksic, M.M. Vrvic, L. Van Griensven, Antioxidants of edible mushrooms, Molecules. 20 (2015) 19489–19525. doi:10.3390/molecules201019489. E.A. Elsayed, H. El Enshasy, M.A.M. Wadaan, R. Aziz, Mushrooms: a potential natural source of anti-inflammatory compounds for medical applications., Mediators Inflamm. 2014 (2014) 805841. doi:10.1155/2014/805841. S. Patel, A. Goyal, Recent developments in mushrooms as anti-cancer therapeutics: a review, 3 Biotech. 2 (2012) 1–15. doi:10.1007/s13205-011-0036-2. T. Xu, R.B. Beelman, J.D. Lambert, The cancer preventive effects of edible mushrooms., Anticancer. Agents Med. Chem. 12 (2012) 1255–63. http://www.ncbi.nlm.nih.gov/pubmed/22583406 (accessed July 12, 2017).